It was the autumn after I had the typhoid. I'd been three months in hospital, and when I came out I looked so weak and tottery that the two or three ladies I applied to were afraid to engage me. Most of my money was gone, and after I'd boarded for two months, hanging about the employment agencies, and answering any advertisement that looked any way respectable, I pretty nearly lost heart, for fretting hadn't made me fatter, and I didn't see why my luck should ever turn. It did though -- or I thought so at the time. A Mrs. Railton, a friend of the lady that first brought me out to the States, met me one day and stopped to speak to me: she was one that had always a friendly way with her. She asked me what ailed me to look so white, and when I told her, "Why, Hartley," says she, "I believe I've got the very place for you. Come in tomorrow and we'll talk about it." The next day, when I called, she told me the lady she'd in mind was a niece of hers, a Mrs. Brympton, a youngish lady, but something of an invalid, who lived all the year round at her country place on the Hudson, owing to not being able to stand the fatigue of town life. "Now, Hartley," Mrs. Railton said, in that cheery way that always made me feel things must be going to take a turn for the better -- "now understand me; it's not a cheerful place I'm sending you to. The house is big and gloomy; my niece is nervous, vaporish; her husband -- well, he's generally away; and the two children are dead. A year ago I would as soon have thought of shutting a rosy active girl like you into a vault; but you're not particularly brisk yourself just now, are you? and a quiet place, with country air and wholesome food and early hours, ought to be the very thing for you. Don't mistake me," she added, for I suppose I looked a trifle downcast; "you may find it dull but you won't be unhappy. My niece is an angel. Her former maid, who died last spring, had been with her twenty years and worshiped the ground she walked on. She's a kind mistress to all, and where the mistress is kind, as you know, the servants are generally good-humored, so you'll probably get on well enough with the rest of the household. And you're the very woman I want for my niece: quiet, well-mannered, and educated above your station. You read aloud well, I think? That's a good thing; my niece likes to be read to. She wants a maid that can be something of a companion: her last was, and I can't say how she misses her. It's a lonely life....Well, have you decided?" "Why, ma'am," I said, "I'm not afraid of solitude." "Well, then, go; my niece will take you on my recommendation. I'll telegraph her at once and you can take the afternoon train. She has no one to wait on her at present, and I don't want you to lose any time." I was ready enough to start, yet something in me hung back; and to gain time I asked, "And the gentleman, ma'am?" "The gentleman's almost always away, I tell you," said Mrs. Railton, quicklike -- "and when he's there," says she suddenly, "you've only to keep out of his way." I took the afternoon train and got to the station at about four o'clock. A groom in a dogcart was waiting, and we drove off at a smart pace. It was a dull October day, with rain hanging close overhead, and by the time we turned into Brympton Place woods the daylight was almost gone. The drive wound through the woods for a mile or two, and came out on a gravel court shut in with thickets of tall black-looking shrubs. There were no lights in the windows, and the house did look a bit gloomy. I had asked no questions of the groom, for I never was one to get my notion of new masters from their other servants: I prefer to wait and see for myself. But I could tell by the look of everything that I had got into the right kind of house, and that things were done handsomely. A pleasant-faced cook met me at the back door and called the housemaid to show me up to my room. "You'll see madam later," she said. "Mrs. Brympton has a visitor." I hadn't fancied Mrs. Brympton was a lady to have many visitors, and somehow the words cheered me. 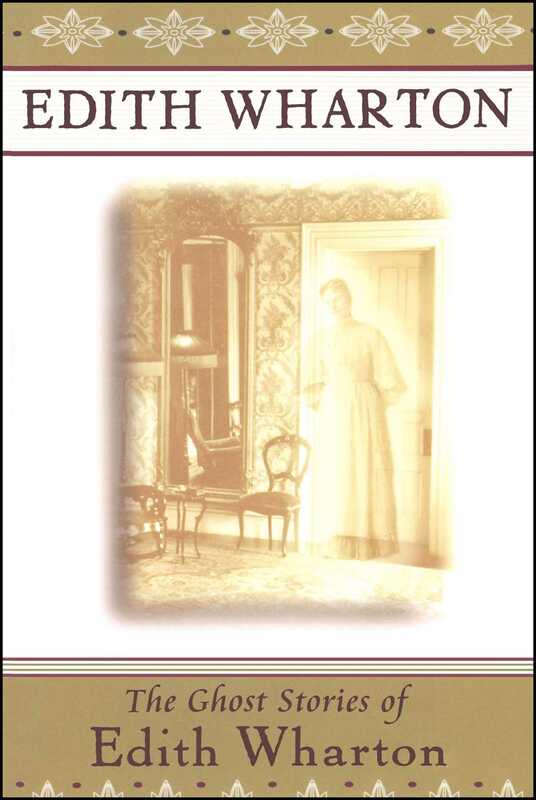 I followed the housemaid upstairs, and saw, through a door on the upper landing, that the main part of the house seemed well furnished, with dark paneling and a number of old portraits. Another flight of stairs led up to the servants' wing. It was almost dark now, and the housemaid excused herself for not having brought a light. "But there's matches in your room," she said, "and if you go careful you'll be all right. Mind the step at the end of the passage. Your room is just beyond." "There -- Mrs. Blinder's left that door open again!" said she, closing it. "Is Mrs. Blinder the housekeeper?" "There's no housekeeper: Mrs. Blinder's the cook." "And is that her room?" "Laws, no," said the housemaid, crosslike. "That's nobody's room. It's empty, I mean, and the door hadn't ought to be open. Mrs. Brympton wants it kept locked." She opened my door and led me into a neat room, nicely furnished, with a picture or two on the walls; and having lit a candle she took leave, telling me that the servants' hall tea was at six, and that Mrs. Brympton would see me afterward. I found them a pleasant-spoken set in the servants' hall, and by what they let fall I gathered that, as Mrs. Railton had said, Mrs. Brympton was the kindest of ladies; but I didn't take much notice of their talk, for I was watching to see the pale woman in the dark gown come in. She didn't show herself, however, and I wondered if she are apart; but if she wasn't the housekeeper, why should she? Suddenly it struck me that she might be a trained nurse, and in that case her meals would of course be served in her room. If Mrs. Brympton was an invalid it was likely enough she had a nurse. The idea annoyed me, I own, for they're not always the easiest to get on with, and if I'd known I shouldn't have taken the place. But there I was and there was no use pulling a long face over it; and not being one to ask questions I waited to see what would turn up. When tea was over the housemaid said to the footman: "Has Mr. Ranford gone?" and when he said yes, she told me to come up with her to Mrs. Brympton. Mrs. Brympton was lying down in her bedroom. Her lounge stood near the fire and beside it was a shaded lamp. She was a delicate-looking lady, but when she smiled I felt there was nothing I wouldn't do for her. She spoke very pleasantly, in a low voice, asking me my name and age and so on, and if I had everything I wanted, and if I wasn't afraid of feeling lonely in the country. "Not with you I wouldn't be, madam," I said, and the words surprised me when I'd spoken them, for I'm not an impulsive person; but it was just as if I'd thought aloud. She seemed pleased at that, and said she hoped I'd continue in the same mind; then she gave me a few directions about her toilet, and said Agnes the housemaid would show me next morning where things were kept. "I am tired tonight, and shall dine upstairs," she said. "Agnes will bring me my tray, so that you may have time to unpack and settle yourself; and later you may come and undress me." "Very well, ma'am," I said. "You'll ring, I suppose?" I thought she looked odd. "No -- Agnes will fetch you," says she quickly, and took up her book again. Well -- that was certainly strange: a lady's maid having to be fetched by the housemaid whenever her lady wanted her! I wondered if there were no bells in the house; but the next day I satisfied myself that there was one in every room, and a special one ringing from my mistress's room to mine; and after that it did strike me as queer that, whenever Mrs. Brympton wanted anything, she rang for Agnes, who had to walk the whole length of the servants' wing to call me. But that wasn't the only queer thing in the house. The very next day I found out that Mrs. Brympton had no nurse; and then I asked Agnes about the woman I had seen in the passage the afternoon before. Agnes said she had seen no one, and I saw that she thought I was dreaming. To be sure, it was dusk when we went down the passage, and she had excused herself for not bringing a light; but I had seen the woman plain enough to know her again if we should meet. I decided that she must have been a friend of the cook's, or of one of the other women servants; perhaps she had come down from town for a night's visit, and the servants wanted it kept secret. Some ladies are very stiff about having their servants' friends in the house overnight. At any rate, I made up my mind to ask no more questions. In a day or two another odd thing happened. I was chatting one afternoon with Mrs. Blinder, who was a friendly-disposed woman, and had been longer in the house than the other servants, and she asked me if I was quite comfortable and had everything I needed. I said I had no fault to find with my place or with my mistress, but I thought it odd that in so large a house there was no sewing room for the lady's maid. "Why," says she, "there is one: the room you're in is the old sewing room." "Oh," said I; "and where did the other lady's maid sleep?" At that she grew confused, and said hurriedly that the servants' rooms had all been changed about last year, and she didn't rightly remember. That struck me as peculiar, but I went on as if I hadn't noticed: "Well, there's a vacant room opposite mine, and I mean to ask Mrs. Brympton if I mayn't use that as a sewing room." To my astonishment, Mrs. Blinder went white, and gave my hand a kind of squeeze. "Don't do that, my dear," said she, trembling-like. "To tell you the truth, that was Emma Saxon's room, and my mistress has kept it closed ever since her death." "And who was Emma Saxon?" "The one that was with her so many years?" said I, remembering what Mrs. Railton had told me. "What sort of woman was she?" d"No better walked the earth," said Mrs. Blinder. "My mistress loved her like a sister." "But I mean -- what did she look like?" Mrs. Blinder got up and gave me a kind of angry stare. "I'm no great hand at describing," she said; "and I believe my pastry's rising." And she walked off into the kitchen and shut the door after her. I had been near a week at Brympton before I saw my master. Word came that he was arriving one afternoon, and a change passed over the whole household. It was plain that nobody loved him below stairs. Mrs. Blinder took uncommon care with the dinner that night, but she snapped at the kitchen-maid in a way quite unusual with her; and Mr. Wace, the butler, a serious, slow-spoken man, went about his duties as if he'd been getting ready for a funeral. He was a great Bible reader, Mr. Wace was, and had a beautiful assortment of texts at his command; but that day he used such dreadful language, that I was about to leave the table, when he assured me it was all out of Isaiah; and I noticed that whenever the master came Mr. Wace took to the prophets. About seven, Agues called me to my mistress' room; and there I found Mr. Brympton. He was standing on the hearth; a big fair bull-necked man, with a red face and little bad-tempered blue eyes: the kind of man a young simpleton might have thought handsome, and would have been like to pay dear for thinking it. He swung about when I came in, and looked me over in a trice. I knew what the look meant, from having experienced it once or twice in my former places. Then he turned his back on me, and went on talking to his wife; and I knew what that meant too. I was not the kind of morsel he was after. The typhoid had served me well enough in one way: it kept that kind of gentleman at arm's length. "This is my new maid, Hartley" says Mrs. Brympton in her kind voice; and he nodded and went on with what he was saying. In a minute or two he went off, and left my mistress to dress for dinner, and I noticed as I waited on her that she was white, and chill to the touch. Mr. Brympton took himself off the next morning, and the whole house drew a long breath when he drove away. As for my mistress, she put on her hat and furs (for it was a fine winter morning) and went out for a walk in the gardens, coming back quite fresh and rosy, so that for a minute, before her color faded, I could guess what a pretty young lady she must have been, and not so long ago, either. She had met Mr. Ranford in the grounds, and the two came back together, I remember, smiling and talking as they walked along the terrace under my window. That was the first time I saw Mr. Ranford, though I had often heard his name mentioned in the hall. He was a neighbor, it appeared, living a mile or two beyond Brympton, at the end of the village; and as he was in the habit of spending his winters in the country he was almost the only company my mistress had at that season. He was a slight tall gentleman of about thirty, and I thought him rather melancholy-looking till I saw his smile, which had a kind of surprise in it, like the first warm day in spring. He was a great reader, I heard, like my mistress, and the two were forever borrowing books of one another, and sometimes (Mr. Wace told me) he would read aloud to Mrs. Brympton by the hour, in the big dark library where she sat in the winter afternoons. The servants all liked him, and perhaps that's more of a compliment than the masters suspect. He had a friendly word for every one of us, and we were all glad to think that Mrs. Brympton had a pleasant companionable gentleman like that to keep her company when the master was away. Mr. Ranford seemed on excellent terms with Mr. Brympton too; though I couldn't but wonder that two gentlemen so unlike each other should be so friendly. But then I knew how the real quality can keep their feelings to themselves. As for Mr. Brympton, he came and went, never staying more than a day or two, cursing the dullness and the solitude, grumbling at everything, and (as I soon found out) drinking a deal more than was good for him. After Mrs. Brympton left the table he would sit half the night over the old Brympton port and madeira, and once, as I was leaving my mistress' room rather later than usual, I met him coming up the stairs in such a state that I turned sick to think of what some ladies have to endure and hold their tongues about. The servants said very little about their master; but from what they let drop I could see it had been an unhappy match from the beginning. Mr. Brympton was coarse, loud and pleasure-loving; my mistress quiet, retiring and perhaps a trifle cold. Not that she was not always pleasant-spoken to him: I thought her wonderfully forbearing; but to a gentleman as free as Mr. Brympton I dare say she seemed a little offish. Well, things went on quietly for several weeks. My mistress was kind, my duties were light, and I got on well with the other servants. In short, I had nothing to complain of; yet there was always a weight on me. I can't say why it was so, but I know it was not the loneliness that I felt. I soon got used to that; and being still languid from the fever, I was thankful for the quiet and the good country air. Nevertheless, I was never quite easy in my mind. My mistress, knowing I had been ill, insisted that I should take my walk regularly, and often invented errands for me: a yard of ribbon to be fetched from the village, a letter posted, or a book returned to Mr. Ranford. As soon as I was out of doors my spirits rose, and I looked forward to my walks through the bare moist-smelling woods; but the moment I caught sight of the house again my heart dropped down like a stone in a well. It was not a gloomy house exactly, yet I never entered it but a feeling of gloom came over me. Mrs. Brympton seldom went out in winter; only on the finest days did she walk an hour at noon on the south terrace. Excepting Mr. Ranford, we had no visitors but the doctor, who drove over from town about once a week. He sent for me once or twice to give me some trifling direction about my mistress, and though he never told me what her illness was, I thought, from a waxy look she had now and then of a morning, that it might be the heart that ailed her. The season was soft and unwholesome, and in January we had a long spell of rain. That was a sore trial to me, I own, for I couldn't go out, and sitting over my sewing all day, listening to the drip, drip of the eaves, I grew so nervous that the least sound made me jump. Somehow, the thought of that locked room across the passage began to weigh on me. Once or twice, in the long rainy nights, I fancied I heard noises there; but that was nonsense, of course, and the daylight drove such notions out of my head. Well, one morning Mrs. Brympton gave me quite a start of pleasure by telling me she wished me to go to town for some shopping. I hadn't known till then how low my spirits had fallen. I set off in high glee, and my first sight of the crowded streets and the cheerful-looking shops quite took me out of myself. Toward afternoon, however, the noise and confusion began to tire me, and I was actually looking forward to the quiet of Brympton, and thinking how I should enjoy the drive home through the dark woods, when I ran across an old acquaintance, a maid I had once been in service with. We had lost sight of each other for a number of years, and I had to stop and tell her what had happened to me in the interval. When I mentioned where I was living she rolled up her eyes and pulled a long face. "What! The Mrs. Brympton that lives all the year at her place on the Hudson? My dear, you won't stay there three months." "Oh, but I don't mind the country," says I, offended somehow at her tone. "Since the fever I'm glad to be quiet." She shook her head. "It's not the country I'm thinking of. All I know is she's had four maids in the last six months, and the last one, who was a friend of mine, told me nobody could stay in the house." "Did she say why?" I asked. "No -- she wouldn't give me her reason. But she says to me, 'Mrs. Ansey,' she says, 'if ever a young woman as you know of thinks of going there, you tell her it's not worthwhile to unpack her boxes.'" "Is she young and handsome?" said I, thinking of Mr. Brympton. "Not her! She's the kind that mothers engage when they've gay young gentlemen at college." When I went in to tea I heard that Mr. Brympton had arrived, and I saw at a glance that there had been a disturbance of some kind. Mrs. Blinder's hand shook so that she could hardly pour the tea, and Mr. Wace quoted the most dreadful texts full of brimstone. Nobody said a word to me then, but when I went up to my room Mrs. Blinder followed me. "Oh, my dear," says she, taking my hand, "I'm so glad and thankful you've come back to us!" That struck me, as you may imagine. "Why," said I, "did you think I was leaving for good?" "No, no, to be sure," said she, a little confused, "but I can't a-bear to have madam left alone for a day even." She pressed my hand hard, and, "Oh, Miss Hartley," says she, "be good to your mistress, as you're a Christian woman." And with that she hurried away, and left me staring. A moment later Agnes called me to Mrs. Brympton. Hearing Mr. Brympton's voice in her room, I went round by the dressing room, thinking I would lay out her dinner gown before going in. The dressing room is a large room with a window over the portico that looks toward the gardens. Mr. Brympton's apartments are beyond. When I went in, the door into the bedroom was ajar, and I heard Mr. Brympton saying angrily: "One would suppose he was the only person fit for you to talk to." "I don't have many visitors in winter," Mrs. Brympton answered quietly. "You have me!" he flung at her, sneeringly. "You are here so seldom," said she. "Well -- whose fault is that? You make the place about as lively as the family vault." With that I rattled the toilet things, to give my mistress warning, and she rose and called me in. After a while I slept; but suddenly a loud noise wakened me. My bell had rung. I sat up, terrified by the unusual sound, which seemed to go on jangling through the darkness. My hands shook so that I couldn't find the matches. At length I struck a light and jumped out of bed. I began to think I must have been dreaming; but I looked at the bell against the wall, and there was the little hammer still quivering. I was just beginning to huddle on my clothes when I heard another sound. This time it was the door of the locked room opposite mine softly opening and closing. I heard the sound distinctly, and it frightened me so that I stood stock still. Then I heard a footstep hurrying down the passage toward the main house. The floor being carpeted, the sound was very faint, but I was quite sure it was a woman's step. I turned cold with the thought of it, and for a minute or two I dursn't breathe or move. Then I came to my senses. "Alice Hartley," says I to myself, "someone left that room just now and ran down the passage ahead of you. The idea isn't pleasant, but you may as well face it. Your mistress has rung for you, and to answer her bell you've got to go the way that other woman has gone." Well -- I did it. I never walked faster in my life, yet I thought I should never get to the end of the passage or reach Mrs. Brympton's room. On the way I heard nothing and saw nothing: all was dark and quiet as the grave. When I reached my mistress' door the silence was so deep that I began to think I must be dreaming, and was half minded to turn back. Then a panic seized me, and I knocked. There was no answer, and I knocked again, loudly. To my astonishment the door was opened by Mr. Brympton. He started back when he saw me, and in the light of my candle his face looked red and savage. "You?" he said, in a queer voice. "How many of you are there, in God's name?" At that I felt the ground give under me; but I said to myself that he had been drinking, and answered as steadily as I could: "May I go in, sir? Mrs. Brympton has rung for me." "You may all go in, for what I care," says he, and, pushing by me, walked down the hall to his own bedroom. I looked after him as he went, and to my surprise I saw that he walked as straight as a sober man. I found my mistress lying very weak and still, but she forced a smile when she saw me, and signed to me to pour out some drops for her. After that she lay without speaking, her breath coming quick, and her eyes closed. Suddenly she groped out with her hand, and "Emma," says she, faintly. "It's Hartley, madam," I said. "Do you want anything?" She opened her eyes wide and gave me a startled look. "I was dreaming," she said. "You may go, now, Hartley, and thank you kindly. I'm quite well again, you see." And she turned her face away from me. There was no more sleep for me that night, and I was thankful when daylight came. Soon afterward, Agnes called me to Mrs. Brympton. I was afraid she was ill again, for she seldom sent for me before nine, but I found her sitting up in bed, pale and drawn-looking, but quite herself. "Hartley," says she quickly, "will you put on your things at once and go down to the village for me? I want this prescription made up --" here she hesitated a minute and blushed "-- and I should like you to be back again before Mr. Brympton is up." "And -- stay a moment --" she called me back as if an idea had just struck her "-- while you're waiting for the mixture, you'll have time to go on to Mr. Ranford's with this note." It was a two mile walk to the village, and on my way I had time to turn things over in my mind. It struck me as peculiar that my mistress should wish the prescription made up without Mr. Brympton's knowledge; and, putting this together with the scene of the night before, and with much else that I had noticed and suspected, I began to wonder if the poor lady was weary of her life, and had come to the mad resolve of ending it. The idea took such hold on me that I reached the village on a run, and dropped breathless into a chair before the chemist's counter. The good man, who was just taking down his shutters, stared at me so hard that it brought me to myself. "Mr. Limmel," I says, trying to speak indifferently, "will you run your eye over this, and tell me if it's quite right?" He put on his spectacles and studied the prescription. "Why, it's one of Dr. Walton's," says he. "What should be wrong with it?" "Well -- is it dangerous to take?" "Dangerous -- how do you mean?" I could have shaken the man for his stupidity. "I mean -- if a person was to take too much of it -- by mistake of course --" says I, my heart in my throat. "Lord bless you, no. It's only lime water. You might feed it to a baby by the bottleful." I gave a great sigh of relief and hurried on to Mr. Ranford's. But on the way another thought struck me. If there was nothing to conceal about my visit to the chemist's, was it my other errand that Mrs. Brympton wished me to keep private? Somehow, that thought frightened me worse than the other. Yet the two gentlemen seemed fast friends, and I would have staked my head on my mistress' goodness. I felt ashamed of my suspicions, and concluded that I was still disturbed by the strange events of the night. I left the note at Mr. Ranford's, and hurrying back to Brympton, slipped in by a side door without being seen, as I thought. An hour later, however, as I was carrying in my mistress' breakfast, I was stopped in the hall by Mr. Brympton. "What were you doing out so early?" he says, looking hard at me. "Early -- me, sir?" I said, in a tremble. "Come, come," he says, an angry red spot coming out on his forehead, "didn't I see you scuttling home through the shrubbery an hour or more ago?" I'm a truthful woman by nature, but at that a lie popped out ready-made. "No, sir, you didn't," said I and looked straight back at him. He shrugged his shoulders and gave a sullen laugh. "I suppose you think I was drunk last night?" he asked suddenly. "No, sir, I don't," I answered, this time truthfully enough. He turned away with another shrug. "A pretty notion my servants have of me!" I heard him mutter as he walked off. Not till I had settled down to my afternoon's sewing did I realize how the events of the night had shaken me. I couldn't pass that locked door without a shiver. I knew I had heard someone come out of it, and walk down the passage ahead of me. I thought of speaking to Mrs. Blinder or to Mr. Wace, the only two in the house who appeared to have an inkling of what was going on, but I had a feeling that if I questioned them they would deny everything, and that I might learn more by holding my tongue and keeping my eyes open. The idea of spending another night opposite the locked room sickened me, and once I was seized with the notion of packing my trunk and taking the first train to town; but it wasn't in me to throw over a kind mistress in that manner, and I tried to go on with my sewing as if nothing had happened. I hadn't worked ten minutes before the sewing machine broke down. It was one I had found in the house, a good machine but a trifle out of order: Mrs. Blinder said it had never been used since Emma Saxon's death. I stopped to see what was wrong, and as I was working at the machine a drawer which I had never been able to open slid forward and a photograph fell out. I picked it up and sat looking at it in a maze. It was a woman's likeness, and I knew I had seen the face somewhere -- the eyes had an asking look that I had felt on me before. And suddenly I remembered the pale woman in the passage. I stood up, cold all over, and ran out of the room. My heart seemed to be thumping in the top of my head, and I felt as if I should never get away from the look in those eyes. I went straight to Mrs. Blinder. She was taking her afternoon nap, and sat up with a jump when I came in. "Mrs. Blinder," said I, "who is that?" And I held out the photograph. She rubbed her eyes and stared. "Why, Emma Saxon," says she. "Where did you find it?" I looked hard at her for a minute. "Mrs. Blinder," I said, "I've seen that face before." Mrs. Blinder got up and walked over to the looking glass. "Dear me! I must have been asleep," she says. "My front is all over one ear. And now do run along, Miss Hartley, dear, for I hear the clock striking four, and I must go down this very minute and put on the Virginia ham for Mr. Brympton's dinner." "Where's Ranford?" says he. "He hasn't been near the house for a week. Does he keep away because I'm here?" Mrs. Brympton spoke so low that I couldn't catch her answer. "Well," he went on, "two's company and three's trumpery; I'm sorry to be in Ranford's way, and I suppose I shall have to take myself off again in a day or two and give him a show." And he laughed at his own joke. The very next day, as it happened, Mr. Ranford called. The footman said the three were very merry over their tea in the library, and Mr. Brympton strolled down to the gate with Mr. Ranford when he left. I have said that things went on as usual; and so they did with the rest of the household; but as for myself, I had never been the same since the night my bell had rung. Night after night I used to lie awake, listening for it to ring again, and for the door of the locked room to open stealthily. But the bell never rang, and I heard no sound across the passage. At last the silence began to be more dreadful to me than the most mysterious sounds. I felt that someone was cowering there, behind the locked door, watching and listening as I watched and listened, and I could almost have cried out, "Whoever you are, come out and let me see you face to face, but don't lurk there and spy on me in the darkness!" Feeling as I did, you may wonder I didn't give warning. Once I very nearly did so; but at the last moment something held me back. Whether it was compassion for my mistress, who had grown more and more dependent on me, or unwillingness to try a new place, or some other feeling that I couldn't put a name to, I lingered on as if spellbound, though every night was dreadful to me, and the clays but little better. For one thing, I didn't like Mrs. Brympton's looks. She had never been the same since that night, no more than I had. I thought she would brighten up after Mr. Brympton left, but though she seemed easier in her mind, her spirits didn't revive, nor her strength either. She had grown attached to me, and seemed to like to have me about; and Agnes told me one day that, since Emma Saxon's death, I was the only maid her mistress had taken to. This gave me a warm feeling for the poor lady, though after all there was little I could do to help her. After Mr. Brympton's departure, Mr. Ranford took to coming again, though less often than formerly. I met him once or twice in the grounds, or in the village, and I couldn't but think there was a change in him too; but I set it down to my disordered fancy. The weeks passed, and Mr. Brympton had now been a month absent. We heard he was cruising with a friend in the West Indies, and Mr. Wace said that was a long way off, but though you had the wings of a dove and went to the uttermost parts of the earth, you couldn't get away from the Almighty. Agnes said that as long as he stayed away from Brympton the Almighty might have him and welcome; and this raised a laugh, though Mrs. Blinder tried to look shocked, and Mr. Wace said the bears would eat us. We were all glad to hear that the West Indies were a long way off, and I remember that, in spite of Mr. Wace's solemn looks, we had a very merry dinner that day in the hall. I don't know if it was because of my being in better spirits, but I fancied Mrs. Brympton looked better too, and seemed more cheerful in her manner. She had been for a walk in the morning, and after luncheon she lay down in her room, and I read aloud to her. When she dismissed me I went to my own room feeling quite bright and happy, and for the first time in weeks walked past the locked door without thinking of it. As I sat down to my work I looked out and saw a few snowflakes falling. The sight was pleasanter than the eternal rain, and I pictured to myself how pretty the bare gardens would look in their white mantle. It seemed to me as if the snow would cover up all the dreariness, indoors as well as out. The fancy had hardly crossed my mind when I heard a step at my side. I looked up, thinking it was Agnes. "Well, Agnes --" said I, and the words froze on my tongue; for there, in the door, stood Emma Saxon. I don't know how long she stood there. I only know I couldn't stir or take my eyes from her. Afterward I was terribly frightened, but at the time it wasn't fear I felt, but something deeper and quieter. She looked at me long and hard, and her face was just one dumb prayer to me -- but how in the world was I to help her? Suddenly she turned, and I heard her walk down the passage. This time I wasn't afraid to follow -- I felt that I must know what she wanted. I sprang up and ran out. She was at the other end of the passage, and I expected her to take the turn toward my mistress' room; but instead of that she pushed open the door that led to the back stairs. I followed her down the stairs, and across the passageway to the back door. The kitchen and hall were empty at that hour, the servants being off duty, except for the footman, who was in the pantry. At the door she stood still a moment, with another look at me; then she turned the handle, and stepped out. For a minute I hesitated. Where was she leading me to? The door had closed softly after her, and I opened it and looked out, half-expecting to find that she had disappeared. But I saw her a few yards off hurrying across the courtyard to the path through the woods. Her figure looked black and lonely in the snow, and for a second my heart failed me and I thought of turning back. But all the while she was drawing me after her; and catching up an old shawl of Mrs. Blinder's I ran out into the open. Emma Saxon was in the wood path now. She walked on steadily, and I followed at the same pace, till we passed out of the gates and reached the highroad. Then she struck across the open fields to the village. By this time the ground was white, and as she climbed the slope of a bare hill ahead of me I noticed that she left no footprints behind her. At sight of that my heart shriveled up within me, and my knees were water. Somehow, it was worse here than indoors. She made the whole countryside seem lonely as the grave, with none but us two in it, and no help in the wide world. Once I tried to go back; but she turned and looked at me, and it was as if she had dragged me with ropes. After that I followed her like a dog. We came to the village and she led me through it, past the church and the blacksmith's shop, and down the lane to Mr. Ranford's. Mr. Ranford's house stands close to the road: a plain old-fashioned building, with a flagged path leading to the door between box borders. The lane was deserted, and as I turned into it I saw Emma Saxon pause under the old elm by the gate. And now another fear came over me. I saw that we had reached the end of our journey, and that it was my turn to act. All the way from Brympton I had been asking myself what she wanted of me, but I had followed in a trance, as it were, and not till I saw her stop at Mr. Ranford's gate did my brain begin to clear itself. I stood a little way off in the snow, my heart beating fit to strangle me, and my feet frozen to the ground; and she stood under the elm and watched me. I knew well enough that she hadn't led me there for nothing. I felt there was something I ought to say or do -- but how was I to guess what it was? I had never thought harm of my mistress and Mr. Ranford, but I was sure now that, from one cause or another, some dreadful thing hung over them. She knew what it was; she would tell me if she could; perhaps she would answer if I questioned her. It turned me faint to think of speaking to her; but I plucked up heart and dragged myself across the few yards between us. As I did so, I heard the house door open and saw Mr. Ranford approaching. He looked handsome and cheerful, as my mistress had looked that morning, and at sight of him the blood began to flow again in my veins. "Why, Hartley," said he, "what's the matter? I saw you coming down the lane just now, and came out to see if you had taken root in the snow." He stopped and stared at me. "What are you looking at?" he says. I turned toward the elm as he spoke, and his eyes followed me; but there was no one there. The lane was empty as far as the eye could reach. A drop of brandy and the warmth of Mr. Ranford's fire soon brought me to, and I insisted on being driven back at once to Brympton. It was nearly dark, and I was afraid my mistress might be wanting me. I explained to Mr. Ranford that I had been out for a walk and had been taken with a fit of giddiness as I passed his gate. This was true enough; yet I never felt more like a liar than when I said it. When I dressed Mrs. Brympton for dinner she remarked on my pale looks and asked what ailed me. I told her I had a headache, and she said she would not require me again that evening, and advised me to go to bed. It was a fact that I could scarcely keep on my feet; yet I had no fancy to spend a solitary evening in my room. I sat downstairs in the hall as long as I could hold my head up; but by nine I crept upstairs, too weary to care what happened if I could but get my head on a pillow. The rest of the household went to bed soon afterward; they kept early hours when the master was away, and before ten I heard Mrs. Blinder's door close, and Mr. Wace's soon after. It was a very still night, earth and air all muffled in snow. Once in bed I felt easier, and lay quiet, listening to the strange noises that come out in a house after dark. Once I thought I heard a door open and close again below: it might have been the glass door that led to the gardens. I got up and peered out of the window; but it was in the dark of the moon, and nothing visible outside but the streaking of snow against the panes. I went back to bed and must have dozed, for I jumped awake to the furious ringing of my bell. Before my head was clear I had sprung out of bed, and was dragging on my clothes. It is going to happen now, I heard myself saying; but what I meant I had no notion. My hands seemed to be covered with glue -- I thought I should never get into my clothes. At last I opened my door and peered down the passage. As far as my candle flame carried, I could see nothing unusual ahead of me. I hurried on, breathless; but as I pushed open the baize door leading to the main hall my heart stood still, for there at the head of the stairs was Emma Saxon, peering dreadfully down into the darkness. For a second I couldn't stir; but my hand slipped from the door, and as it swung shut the figure vanished. At the same instant there came another sound from below stairs -- a stealthy mysterious sound, as of a latchkey turning in the house door. I ran to Mrs. Brympton's room and knocked. There was no answer, and I knocked again. This time I heard someone moving in the room; the bolt slipped back and my mistress stood before me. To my surprise I saw that she had not undressed for the night. She gave me a startled look. "What is this, Hartley?" she says in a whisper. "Are you ill? What are you doing here at this hour?" "I am not ill, madam; but my bell rang." At that she turned pale, and seemed about to fall. "You are mistaken," she said harshly; "I didn't ring. You must have been dreaming." I had never heard her speak in such a tone. "Go back to bed," she said, closing the door on me. But as she spoke I heard sounds again in the hall below: a man's step this time; and the truth leaped out on me. "Madam," I said, pushing past her, "there is someone in the house --"
"Mr. Brympton, I think -- I hear his step below --"
A dreadful look came over her, and without a word, she dropped flat at my feet. I fell on my knees and tried to lift her: by the way she breathed I saw it was no common faint. But as I raised her head there came quick steps on the stairs and across the hall: the door was flung open, and there stood Mr. Brympton, in his traveling clothes, the snow dripping from him. He drew back with a start as he saw me kneeling by my mistress. "What the devil is this?" he shouted. He was less high-colored than usual, and the red spot came out on his forehead. "Mrs. Brympton has fainted, sir," said I. He laughed unsteadily and pushed by me. "It's a pity she didn't choose a more convenient moment. I'm sorry to disturb her, but --"
I raised myself up aghast at the man's action. "Sir," said I, "are you mad? What are you doing?" "Going to meet a friend," said he, and seemed to make for the dressing room. At that my heart turned over. I don't know what I thought or feared; but I sprang up and caught him by the sleeve. "Sir, sir," said I, "for pity's sake look at your wife!" He shook me off furiously. "It seems that's done for me," says he, and caught hold of the dressing room door. At that moment I heard a slight noise inside. Slight as it was, he heard it too, and tore the door open; but as he did so he dropped back. On the threshold stood Emma Saxon. All was dark behind her, but I saw her plainly, and so did he. He threw up his hands as if to hide his face from her; and when I looked again she was gone. We buried her on the third day, in a driving snowstorm. There were few people in the church, for it was bad weather to come from town, and I've a notion my mistress was one that hadn't many near friends. Mr. Ranford was among the last to come, just before they carried her up the aisle. He was in black, of course, being such a friend of the family, and I never saw a gentleman so pale. As he passed me, I noticed that he leaned a trifle on a stick he carried; and I fancy Mr. Brympton noticed it too, for the red spot came out sharp on his forehead, and all through the service he kept staring across the church at Mr. Ranford, instead of following the prayers as a mourner should. When it was over and we went out to the graveyard, Mr. Ranford had disappeared, and as soon as my poor mistress' body was underground, Mr. Brympton jumped into the carriage nearest the gate and drove off without a word to any of us. I heard him call out, "To the station," and we servants went back alone to the house.